Roosevelt University’s Professional Mentoring Program matches undergraduates with working and retired professionals in a variety of fields to help students establish their futures. Mentors provide support and guidance to their mentees in order to help them be more career ready by graduation. 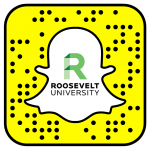 To apply as a mentee or mentor go to roosevelt.edu/mentoring, we’re always accepting applications! 1098T OPT-IN CONSENT: NEW PROCESS COMING SOON!! Need Info on Dental School Applications or What it is to be a Dentist? $15 Student Rush Tickets to Ella & Lena: The Ladies and Their Music!